Synopsis: The Red Skull defeats Captain America in 1941, but the super hero is thrown into suspended animation. Captain America is revived 50 years later to face the Red Skull one more time. 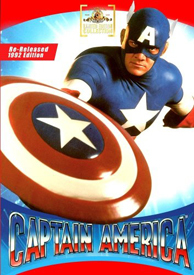 Review: Of all of the Super Hero films that have been released and some unreleased (ie Fantastic Four (1994) produced by Roger Corman) there has been a few that I never in the world would of thought they would ever release Captain America on any other format besides the very much out of print VHS tape or laserdisc. Now at long last this one is available which is probably mostly due to the release of the new Captain America which is a very smart move. I remember when I first ever saw this film back in the early to mid-nineties, I was browsing the action section of a video store called E&D's Video and I was instantly drawn in by it's cover and the fact that it was a comic book hero. For many this film was and will always be a failure on many levels but to someone like myself it is a throw back to our youth. Was the film low budget and campy? Why yes it was, but that is what gave the film it's charm. Now it wasn't completely badly budgeted, the costumes and sets where very well done, but the film does have that good old "made for TV film" look. As far as the actors go you get the talents of Matt Salinger (Revenge of the Nerds) as Captain America, Scott Paulin (The Right Stuff) as Red Skull, and the great talents of Ned Beatty (Deliverance) as Sam Kalowetz as well as Darren McGavin (A Chrstmas Story) as General Fleming to name a few of them. The action is not overly brutal and stays on what they call "cartoon violence" so this is a film that you could show to kids without them seeing graphic violence or gore. The only thing that suffers about this release is the overall picture quality, I wish they could of gotten a better source than the one that they used. Now being a fan of this film I won't complain about it too much due to the fact that it's great to see this one being released on DVD at all. It is more on the VHS or laserdisc quality which may disappoint some and be just fine for others like myself. Overall I highly recommend this version of Captain American to anyone who is a fan of super hero film and that don't care what the budget is!